It’d been a very long week. I’d been on a number of planes, slept in a couple low-rent hotels and basically ate nothing healthy or appetizing for a few days on end. But when I excitedly got home to my family (and my new vaporizer) and eventually unboxed the Flora, my initial reaction was disappointment. After interacting with representatives from the company, I was super-excited about tinkering with this new product. But when I opened the lid, the Flora looked and felt very much like any another Chinese-made vape with white-labeled technology. But don’t you love being proven wrong, if only temporarily? 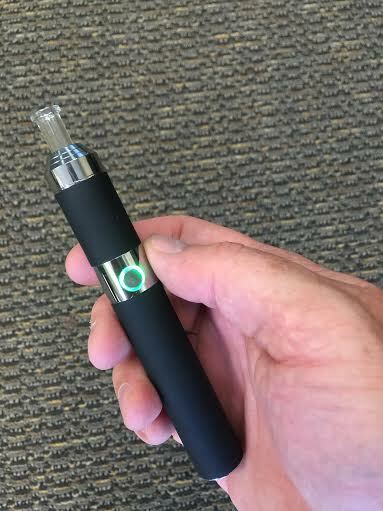 Although the Vaped Flora is made in China, I instantly noticed that this vape was different than many of its competitors as soon as I fired it up. This portable vaporizer produces one of the largest vapor clouds I have ever seen from a handheld. Even with my higher-than-average expectations, I was really surprised by how well this $120 portable functioned. A couple good hits and everything that had me down about traveling was quickly a worry of the past. But as I dug in a little further into this particular device, I did notice some flaws. Designwise, the Flora is slightly thicker than a pen-style vape. The on/off switch is in the middle of the body, and the top unscrews to expose the bowl, which is cylindrical but tapers towards the outer edge of the pen, making it easier to load. The mouthpiece and bowl are both glass — a nice, clean touch and the reason the Flora is marketed as a “glass-on-glass” vaporizer — and the vape also comes with an extra mouthpiece in case you lose or break it. One of the Flora’s flaws: There is not enough information in the vape’s instructions to figure out how to properly use it. I found myself scouring the Internet to find more information — manufacturer’s instructions, other users’ recommendations, redditors’ snarky suggestions. I quickly came to the conclusion that someone like my mom would be lost using this vape, though if you’re vaguely familiar with other vaporizers you’ll be able to figure out the Flora’s basic functionality. Also, this vape has no temperature control — a feature that is becoming more and more standard in the $100-$200 price range. I found that the bowl cooks very quickly and at a higher heat, thus the large vapor cloud I mentioned earlier. However, the high heat burns the contents so quickly that you really only get a few good puffs before you start worrying about finding the included tool to clean it out. Worth noting: The tools that are included in the package are cheaply made, as is the case that it comes with. Long story short: This is a pretty cool vape for $120. The vape cloud is awesome, and I like the simplicity. It lacks the customizable technology it now takes to be considered high end, but the subtle differences against other Chinese technology do make a big difference. Manufacturer Vaped needs to improve on what is included in the package — a more detailed instruction manual would be a great place to start. But I would recommend this vape for someone who is looking for a somewhat-inexpensive handheld that works well at delivering a potent blast of smoke.